It was my privilege recently to spend two days with Miss Jessie Field, County Superintendent of Education in Page County, Iowa, in an endeavor to discover the secret of the reputa­tion that her schools have attained among the country schools of the United States. I found it in Miss Field herself, and in the application of her motto. "We must teach a country child in terms of country life." Page County lies off the beaten travel routes, on the Missouri line in southwestern Iowa, and Clarinda, the county seat, is somewhat hard to reach. As our train moved leisurely through the fertile, rolling valley I saw everywhere the signs of rural prosperity. The homes and farm buildings were comfortable and attractive, the roads were fair, and the rural telephone was universal. The shocks of corn, the harrowed fields ready for the wheat crop, the hay stacks, the barrels of apples under the trees that were being stripped of their red and golden burden, and the bluegrass pastures with their droves of cattle, hogs, 4nd sheep, told a story of intelligent, diversified farming. Miss Field herself greeted me at Clarinda; she was expecting my visit. "Your train is late," she said, "but I have a runabout here, and we will have time to see one school before closing time." Without further ceremony we stepped into a little car and were off to a country school three miles from Clarinda. It didn't take us long to reach the school — it never does in Iowa. The consoli­dation movement has made little headway, in this country at least, and there is, in general, a one-room school every two miles. As we entered the room Miss Field was greeted by a battery of smiles from the teacher and the children, who knew her and rejoiced at her coming. She knows by name most of the school children of the county. They also knew how to welcome a stranger, and in a quiet way each endeavored to show me a thoughtful attention. I was soon decor­ated with the Page County badge — an enameled clover leaf bearing three H's and the words "Page County, Iowa." The spirit that pervaded the school made it easy to guess what the H's stood for — "head," "hand," and "heart." In the school room I immediately per­ceived a wholesome country atmosphere that characterized all the schools we visited. Many of the boys were dressed in "jumpers" and they wore them proudly as a uniform of a most honorable calling. In addition to the maps, globes, and other equipment of the ordinary school there were tables and seed testing boxes made by the boys with ordinary farm tools, while collections of seeds and exhibits of insects were displayed on the walls. 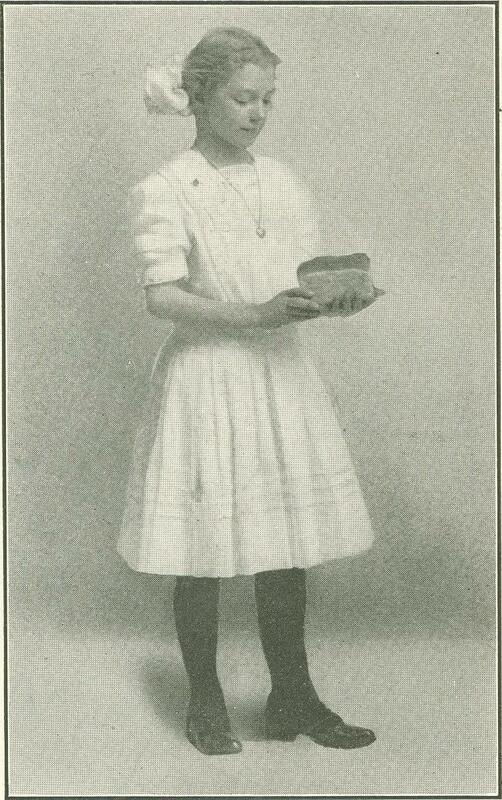 The composition book of one grade was entitled, "Things we should know about home," and the index showed such sub­jects as, "Why I like to live in the coun­try," "How to make a loaf of bread,"
How to make a bed," "How to use the Babcock milk tester." A grammar lesson was in progress. Even in this formal subject there appeared many applications of Miss Field's motto: "We must teach a country child in terms of country life.” The boy who was called on to illustrate a compound sentence did not struggle vainly to remember some sentence which he had seen in the book or had read in ancient history, but, looking quite naturally out of the school window on a neighboring orchard, said, " It is the 9th of October, and the farmers are gathering apples." At the close of the school I was honored with a special introduction to the girl who took the prize for the best cookies at the last industrial fair, to the boy who had taken the prize for the best ear of corn, and to the school representative in the industrial fair organization, with whom Miss Field held a brief consultation about the next school exhibit. In the meantime the children who had been dismissed were waiting outside the school room on the lawn for Miss Field and the game that she had promised to teach them at her next visit. The next ten minutes on the well-kept lawn cemented more closely the friendships of the school room and left each child richer in social possibilities. On the way back to Clarinda, Miss Field stated briefly her educational principles and her methods of work as county superintendent. When she entered the office, the schools of Page County were little better or worse than the ordinary country system in Iowa. The teachers were, for the most part, without special training and there was little professional enthusiasm. It was no unusual thing to change positions at the end of each school term of two or three months. Most of the country pupils dropped out of school at the end of the period of compulsory attendance, and only about fifty per year completed the eighth grade. The teachers taught reading, writ­ing, arithmetic, and the other elementary subjects in the ordinary, conventional way. Hence they believed that, if you developed a boy's general intelligence by means of parsing, he would instinctively know how to select a milch cow or how to organize a cooperative fruit grower's association; or if he learned about the German Empire thoroughly, he would in some way develop later into a good corn grower or an enthusiastic poultry breeder; or if he learned to solve problems in cube root, he would of course know how to estimate the capacity of a corn crib or test a sample of milk for the percentage of butter-fat. They assumed that if a pupil worked hard enough on the ideas and ideals connected with the history of Egypt, he would thereby eventually develop a patriotic devotion to Page County. Miss Field adopted a very simple philosophy. It was this: "If mental discipline acquired in one field of study spreads over the border and enables the student to work better in another, why shouldn't we begin with the actual life of Page County and spread out from there? Instead of trying to teach a love for the whole United States in general and trust­ing that in some mysterious way this will eventually percolate down to the school district, why not aim to develop an intense love for the school and a loyalty to Page County and let this gradually expand into a larger patriotism?" Miss Field's philosophy has worked. Her first task was to inspire and train her teaching force. As she visited the schools of the county she picked out from the 130 teachers a dozen who were willing to meet regularly and led them to organize themselves into a Progressive Teachers' Club. These began a systematic study of the specific rural school problems of the county and made a steady effort to relate their schools vitally to the life of the community. Certain definite things to be done by the teachers were fixed as prerequisites to admission to the organiza­tion, and one by one the other teachers applied for membership and were received until now every teacher in the county is a member of the Progressive Club. Few of these teachers are college or normal school graduates. Most have received their professional training as the result of their experience under Miss Field's supervision, in the discussions of the Progressive Club, in the county institute, or in the summer session of the state nor­mal school. Thirty-five teachers from the county attended the state summer school during the past summer. The county institute is held for ten days during the summer. I asked Miss Field if attendance at the institute were compulsory. She replied that it was purely voluntary. "How many of your teachers attend?" I asked. "They were all there," she an­swered, as if it were a matter of course. Miss Field is a sincere friend to all her teachers, and they are loyal to her accordingly. The salary schedule in Page County is higher than the average in Iowa. Miss Field's own example is a continuous lesson in appreciation, and the school patrons have not been slow to learn to express their appreciation in those ways which mean quite as much as money to the conscientious worker. Has your school year been lengthened? Are the teachers' wages higher than last year? Have the number of classes on the program been lessened? How many attendance certificates have you issued? How many diplomas and pins? Have the older pupils remained through the school year? Can your school sing "Iowa"? Did your school take any part in the county essay contest? 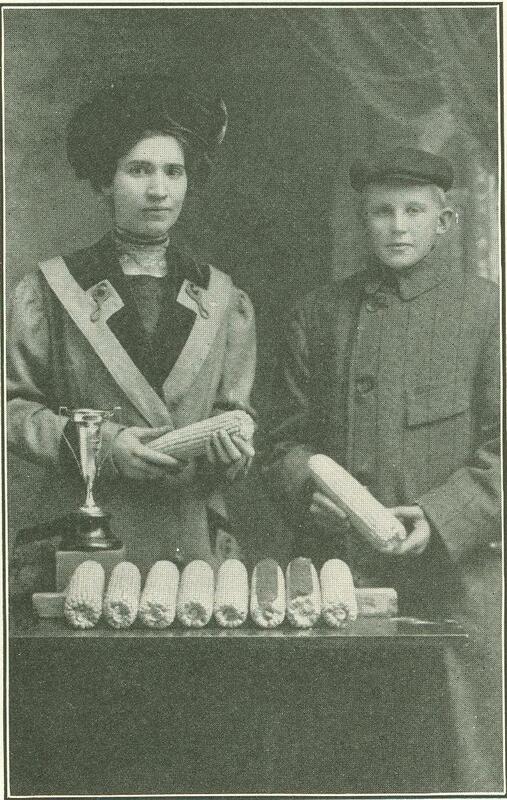 In the county boys and girls' industrial exposition and corn show? Are there boys and girls in your district enrolled in the state junior agricultural work? Have you taught the farm arithmetic work? What have you done in manual training and hand work? State anything else that you have done to connect your school more closely with the farms and homes in your district and to serve their interests. Have you a school garden? State all that has been done to make the school house and grounds more beautiful and useful. Are your pupils thoughtful and courteous? Is there improvement in habits of study? Has your school done anything for your district in the way of literary societies and social recreations? We may easily imagine the effect of such definite and concrete ideals set before the teachers. Early next morning I found Miss Field in her office with her secretary, opening the day's mail. Many of the letters were from members of her student co­operative committee, which has a repre­sentative in every school. They were in response to inquiries from Miss Field concerning the pupils of the district who had not yet started to school. She finds the student committee one of her strong­est helpers in the county organization. On display in the office were the state tro­phies that had been won by the schools of the county. We were soon in the car again and on our way to the Olive Branch school. Al­though the morning was inclement most of the pupils were on hand. We arrived for the opening exercise. Among the songs were "Iowa" and "The Whistling Farmer Boy." The morning nature lesson was a recognition and discussion of weeds that had been gathered on the way to school, and a drill on the recognition of the varieties of apples that were being har­vested in the community. It was October loth, the day on which seed corn is selected in Iowa. A pupil gave the reasons for picking seed corn at that time, and two boys with a string exemplified the best way to hang up the corn after it has been selected. The primary reading les­son that followed was based on a chart that had been made by the teacher in which she had used the pictures of birds common in the community, with sentences about the appearance and habits of each. The arithmetic class was studying mensuration. The pupils had each been told to measure a corn crib at home, and the problems that were given them to work at the board had to do with the capacity of the crib, the amount of corn that it would hold, and the value of the corn. 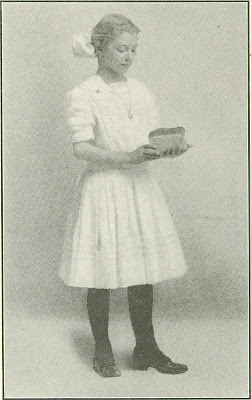 For the guidance of her teachers and pupils along practical lines, Miss Field has written a farm arithmetic, that she calls "a book of real problems for farm boys and girls," and which she says "con­tains nothing about longitude or time, cube root, English money, or the binomial theorem, but is devoted to the sort of work that the farm boys and girls will use every day in actual life." The manual training work for the boys displayed in the school room was related to the practical work of the farm, and included such pieces as kitchen tables, milk stools, and models for farm devices that had been made during the year. This same common-sense adaptation of the conventional course of study to the needs of everyday life characterized all the schools we visited. Not that the knowledge of the pupils is confined to local material, but in their contempla­tion of the distant Italy beyond the Alps they habitually recognize the solid earth of Page County beneath their feet. Miss Field has not found it desirable to develop extensive school gardens. The school grounds are covered with blue­grass, are well-kept, and are usually ornamented with beds of tulips and other simple flowers. The dominant motive in Page County is to center in the home the larger part of the pupil's activity. The summer holiday prevents a full development of the school garden, and the work at home under the inspiration of the school enlists a more active interest on the part of the parents. The motive for the manual and in­dustrial work is furnished by the county industrial fair that is held every December. At this fair prizes are offered by the business men of the county for all kinds of handiwork, and the boys and girls of the county are busy months in advance preparing for it. The county superintendent of education and the teachers furnish the suggestions, directions, and the inspiration for this work, and the pupils do it mostly at home. As we rode over the county Miss Field pointed out the home where the boy lived who had taken first prize on his acre yield, or where the girl lived who had been a member of the cooking team that had won the state trophy at Ames. Occasionally we came to a section of the road that was very much better than other sections over which we had passed. Miss Field explained that one prize at the industrial fair was given for the best model of the King road drag, and that the automobile association had offered a prize to the Page County boy who, with a road drag, would keep a half mile of road in the best condition. She pointed out the home of a boy who had been thought incorrigible, but who had been changed into one of the most reliable boys in the county through the activity and interest that had been aroused by participation in a corn raising and corn judging contest. 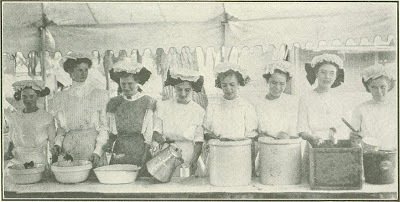 She told how handy farm devices, model kitchens, and devices for lightening the labor in the home are becoming universal in the county through the influence of the models exhibited in the school contests at the industrial fair; how prizes offered for miniature model farms, showing the placing of house, barns, orchard, pasture, and giving a crop rotation plan for five years, had resulted not only in a creditable exhibit but also in a universal knowledge of the best crop rotations for the county. Entry in the industrial fair may be made by the individual boys and girls or by the school. A silver trophy is awarded to the school making the best exhibit. The child who does not win in these contests is not forgotten, and every exhibitor is presented with the clover leaf pin of Page County. For the last two years a specialty of the agricultural and industrial work has been the boys' farm camp. This is held for two weeks in connection with the Chautauqua Assembly at Clarinda. Prof. E. C. Bishop, formerly state superinten­dent of schools for Nebraska, but now in charge of the extension work at Ames, has charge of the camp and directs the games and sports of the boys. Prof. R. K. Bliss and Prof. Murl McDonald of Ames offer short courses in stock judging and in corn and grain judging. From the boys who take this course, teams are selected and sent to take the agricultural short course offered at the state college of agriculture in January. The Page County team has won the state trophy in corn judging for two years in succession, and hopes next January to win it for the third time and thus to keep it perma­nently. The boys who go to Ames come back to the county and help teach the younger boys who will later hold up the banner of Page County. The boys' camp was such a success that the people thought they must have a camp for the girls also. They called it "The Camp of the Golden Maids." 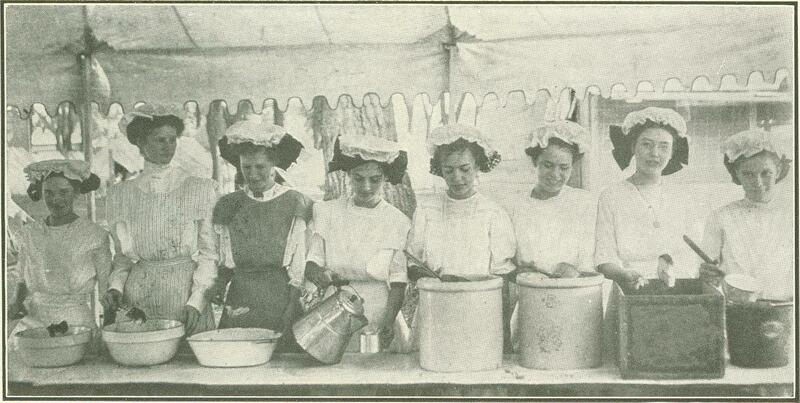 The girls at the camp study cooking and sewing under Mrs. Knowles and Miss Campbell of the state college. The county cook­ing team was selected and sent to the state college for the short course, and, as you may easily guess, brought home the state cooking trophy which now keeps company with the other trophies in the county superintendent's office. All this work has resulted in a Page county school spirit that is almost invincible. One noteworthy result of the new educational spirit is the almost total elimination of the school discipline prob­lem. The boys and girls are too busy for mischief, and the teachers are too busy and interested to indulge in those morbid mental states that make school manage­ment difficult. At the close of the school session every spring, graduating exercises are held at convenient points in the county, and those who have finished the course in the elementary schools meet and, in the presence of parents and friends, are awarded the county certificate. Two years ago the Omaha Exposition offered an automobile as a prize to the county whose schools would send the best agricultural and industrial exhibit. Page County won. What should be done with the automobile? "Why, give it to Miss Field, of course, so that she can come to see us oftener," was the answer in one voice. Miss Field has the automobile yet, and almost every day in Page County you may meet her out among the county schools, an inspiration to all who come in contact with her. The World’s Work Magazine. June 1912.